A rather long and thin country, the ancient French Indochina occupies a large swathe of coastline in the South China Sea. Travel to Vietnam to appreciate the important historical influence of the Chinese in this country, both in terms of culture and tradition., You will also discover the features of a landscape that resembles a watercolour painting. The far north is home to the most colourful ethnic groups. To the east, large rocks create labyrinths in both the land and the sea. To the south, the floating market of the Mekong river is not to be missed. On the hiking trails of Vietnam, nature is abundant in all forms, erasing traces of past wars from dense forests, which have now joined the tourist trail, like the famous Cu Chi tunnels. 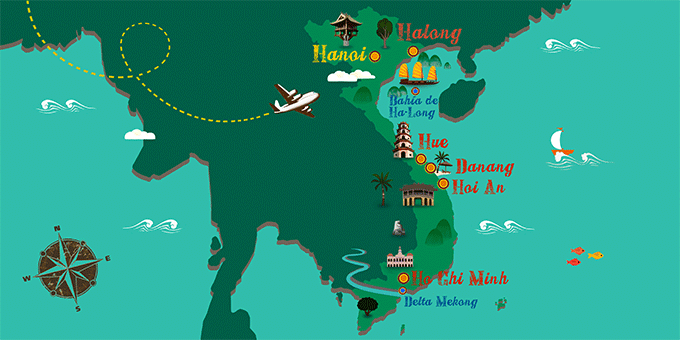 What's more, Vietnam has seen a turnaround in just a few short years, embracing private investment and improving infrastructure, recovering temples and cultural heritage, attractions to complement its deserted beaches, a staple of any package holiday to Vietnam.